I attached Post-it ‘Flags’ to a number of pages in my copy of Dubi Benyamini’s A Field Guide To The Butterflies of Israel. Did that before I left Pittsburgh. Pittsburgh to Boston, then El Al flight to Ben Gurion International. The challenge was on, because with a single exception, no one gave me any inside skinny as to where to find them. I give you a map, and I challenge you to find a specific species of uncommon butterfly, in a 3-county sector in your state or region . . . I tell you that is a substantial challenge. This trip I was determined to bust-out somewhat from my usual comfort level, i.e., not go to where I know, but go to where challenge awaits. That I did, on my own, no longer awaiting your arrival. 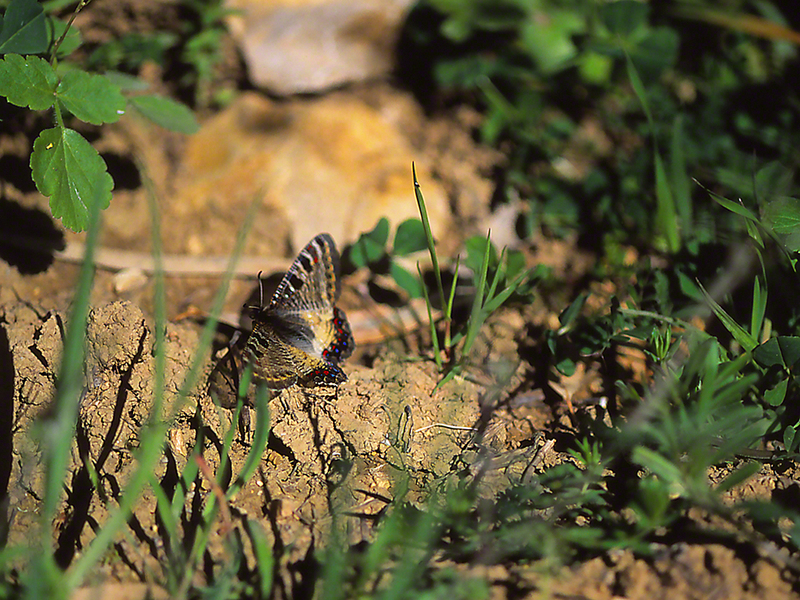 I almost stepped on this False Apollo butterfly, as I worked the perimeter of tiny Neve Ativ moshav (village) at the foot of Mt. Hermon. Several had eluded me those 2 days last year, and I was wired, for I saw that those that fled me were . . . gorgeous swallowtail relatives. I was going to go home without an image, until I nearly crushed this one with my shoe. This butterfly must have been commanded from Above to remain in place. Otherwise, why didn’t it do the Israeli butterfly thing? i.e., Whoosh! gone. I followed the Technique procedure and it didn’t move. I took a number of photographs and then she jetted away. Gone. This image is the best of them. Three things characterize it: 1) I was still too far way 2) She was breathlessly beautiful 3) Examine her incredible colors by clicking on the image. Then tell me if you don’t agree with me. So this year’s trip to Mt. Meron and the Upper, upper Galilee just ended. One of its most compelling goals was to get closer to False Apollos (Archon apollinus bellargus). And I did! Several times! I made perhaps as many as 20 or 30 exposures (all a blur, I confess). Now, more than once have I thought of Heinz ketchup. Once upon a time there were TV commercials citing the Anticipation you’d experience as you waited for your ketchup to quit the bottle and drop onto your burger. I must wait for Dwayne’s Photo (Parsons, KS) to process and return my slides. I have to wait to reintroduce myself to them, to see how many I got, and which are keepers. How much I want another, equally shmeksy! image of this winged beauty. My readers understand, don’t you?